The inhibit input on the 4QD controllers is designed to be used in conjunction with a microswitch sensing the foot brake on an electrical vehicle. Our features area explains this operation of the Foot-Brake inhibit. Therefore, as standard, the the speed does not ramp down under control of the ramp circuit when the inhibit is used. There may be applications where it is desired that the inhibit engage the normal deceleration ramp. This page explains how to change the control board to this behaviour. Locate Tr 9, near the Decel preset. Transistor numbers are printed on the component side of the board. It is Tr9 that controls the over-riding of the ramps by the inhibit input. 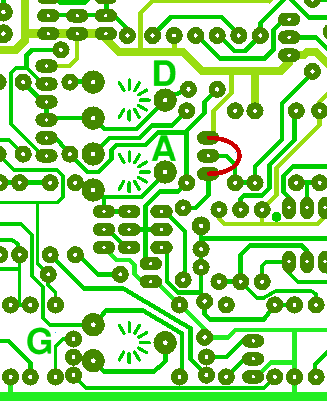 Short out Tr9 by a wire link as shown in red on the diagram: this shows the solder side of the board around the Decel preset. The centre (base) may be part of the short or not as you find convenient. With this transistor linked out, the controller will decelerate under control of the deceleration ramp when the inhibit input is used.